Every dollar you contribute supports our artistic and community programs. 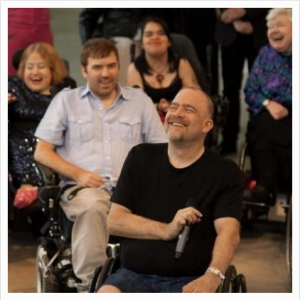 Your gift – at any amount – makes an important contribution to disability arts, as Realwheels’ work has a proven, measurable impact on audiences’ perceptions of persons with disabilities. We also take the dialogue beyond the stage, offering an array of public forums and outreach programs that explore the theatrical, psychological, social and technological elements of our work. Moreover, we provide people in the disability community experiences in the performing arts and assist in the development of emerging artists with disabilities. Please join our wonderful supporters by making a (tax-deductible) gift today.